Plain City ArtSplosion: Second Friday Every Month This Summer! Come out This Friday, July 12! « Restore the Jerome Township Soldiers Monument and Help Recognize Other Veterans. 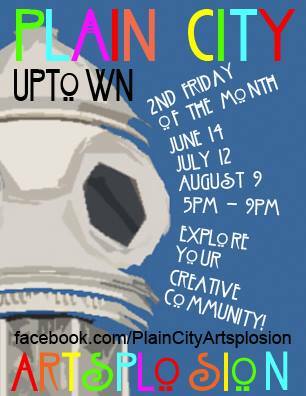 Head downtown for the Plain City ArtSplosion on the Second Friday of each month this summer from 5-9 pm. The first Friday ArtSplosion was held on June 14th. The other Friday ArtSplosions will be July 12 and August 9. Join local artisans who will present handmade goods and artwork for sale. If you are an artist, you can display and sell your work at the ArtSplosion. For more information, call 614-873-7314. There will also be kids activities and an ice cream social hosted by The Plain City Historical Society. The Plain City Historical Society will be selling ice cream and pie as a fundraiser during the ArtSplosion. If you would like to volunteer to make pies for the Historical Society’s ice cream social on Friday, you can call Kathy Cosgray at 614-873-5562 to donate your culinary talents. Pies can be dropped off at the Historical Society after 4 pm on Friday or Kathy will pick them up. For the June ArtSplosion, the Historical Society had 12 pies and one cobbler and they ran out by 7:30 pm. This month, they would like to have between 20-24 pies and cobblers. No cream pies, please. If you would like to volunteer to cut pies, scoop ice cream, or serve, stop by the Historical Society on Friday between 5 and 9 pm and they will put you to work. In June, the Historical Society made over $200 in less than three hours. Please help them raise even more money at this Friday’s ArtSplosion. For more information and photos of the first ArtSplosion event, check out the Facebook site HERE.